This set of stays is from an Italian collector of clothing from many time periods. Follow the link and you will see a number of items of interest from the 18th century onwards. 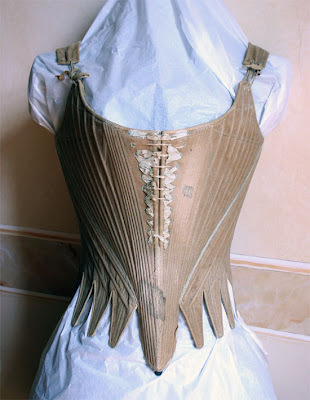 These are some of the best photographs that I have seen online of an 1780s style pair of stays. The back is not laced properly, but you can still see the offset lacing holes and the very high back of this style of stays. She is an Italian collector, but we can't assume that these are Italian, but we can probably assume they are European. This side view gives a really good look at how those slanted channels and curved side seams shape the body. What you don't see is how narrow these boning channels actually are, having looked at many similar, I would estimate that the bones are no more than 5mm and could actually be less. Once again in this time period the outer fashion fabric is a plain shade of beige/brown cotton. The leather binding of the stays is now being replaced by linen or cotton tape. The fingers/tabs are more tooth like and less rounded than in earlier stays. The partial front lacing allows for some accommodation to round out the shape. There are two sets of lacing holes, one to actually draw in the stays and another for a decorative ribbon. 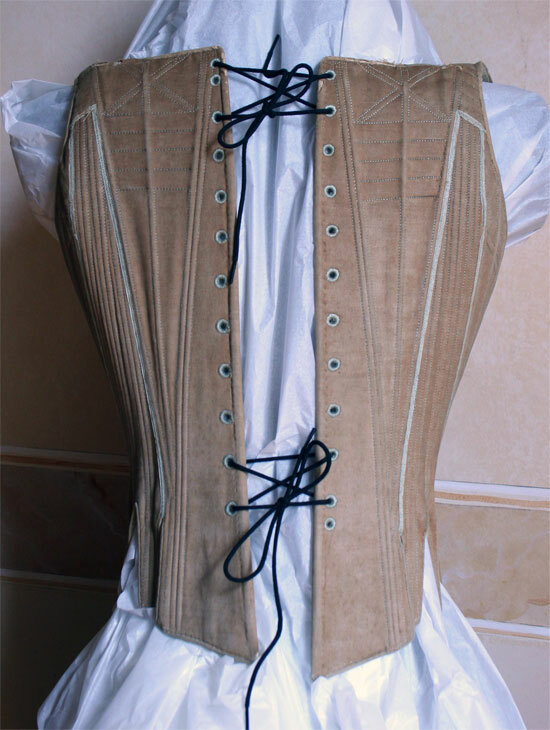 The front is very narrow with the boning pattern drawing the bust in and the shoulder straps providing support. This is a very nice pair of later stays. What do you mean by "outer" stays? 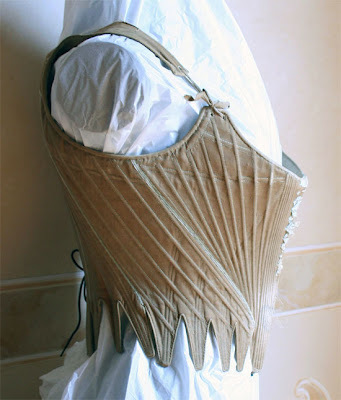 Were these worn outside of a bodice?